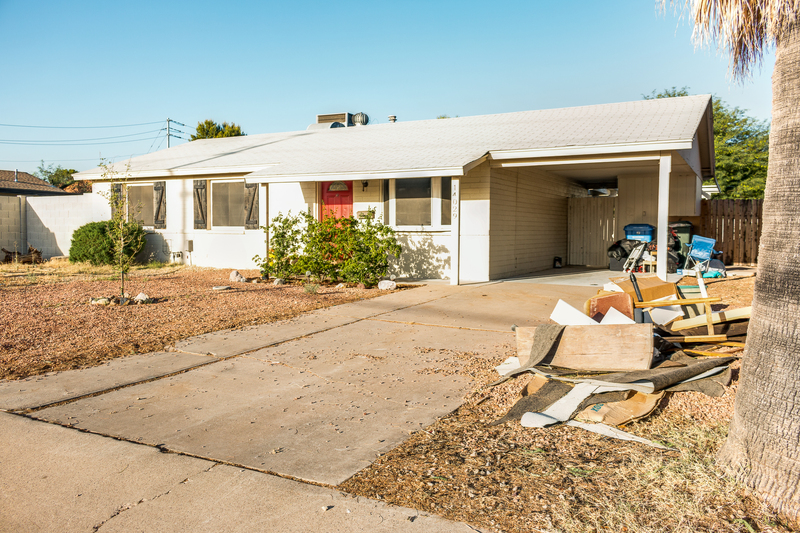 36th Street: North Phoenix Remodel Before and After | Lugo & Co.
Howdy, hey! 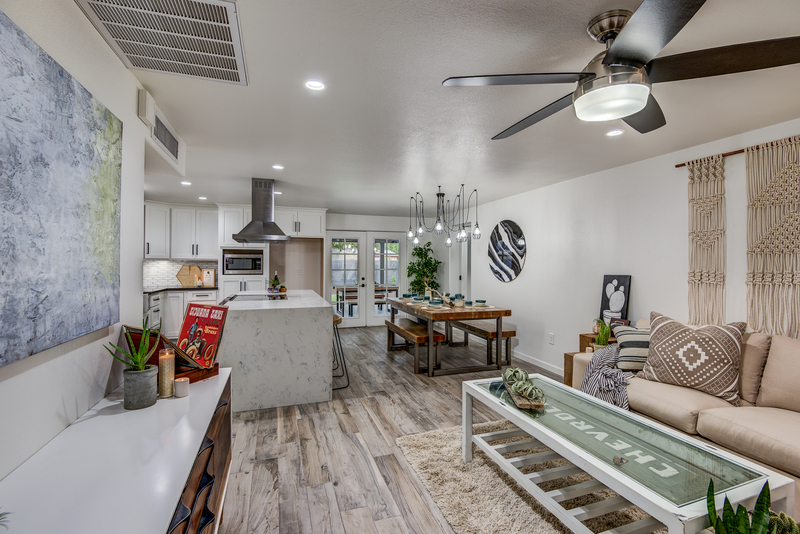 We are coming off of a great weekend, where we finally revealed our latest project in North Phoenix. This was an exciting home for us to tackle, because it just so happened to be right in the neighborhood we live in. If you’re more video inclined, we made a little walk-through video to detail all the work that went into this home! For the before and after photos, keep on scrolling. Bryce grew up in the home we live in now. Since early on in our relationship, we’ve lived here in this John F. Long single family home. We love the area: great freeway access, Target and Costco right around the corner, and a Chipotle less than a mile away. Perfect! So when we got the opportunity to turn a home in our ‘hood, we were pretty excited. 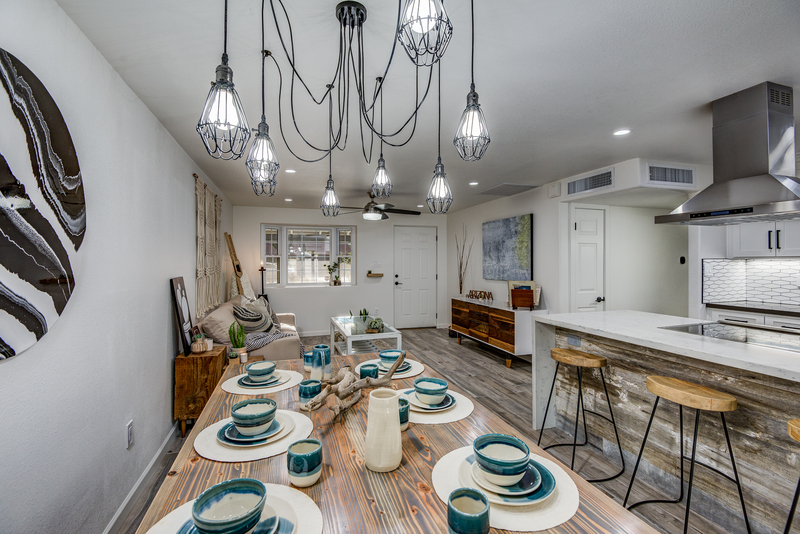 This sweet family home had somewhat of a past, and we were really excited to bring in some new light into the property. Our friends at Local Trade did the staging, and it came out incredibly! Thanks Tony! 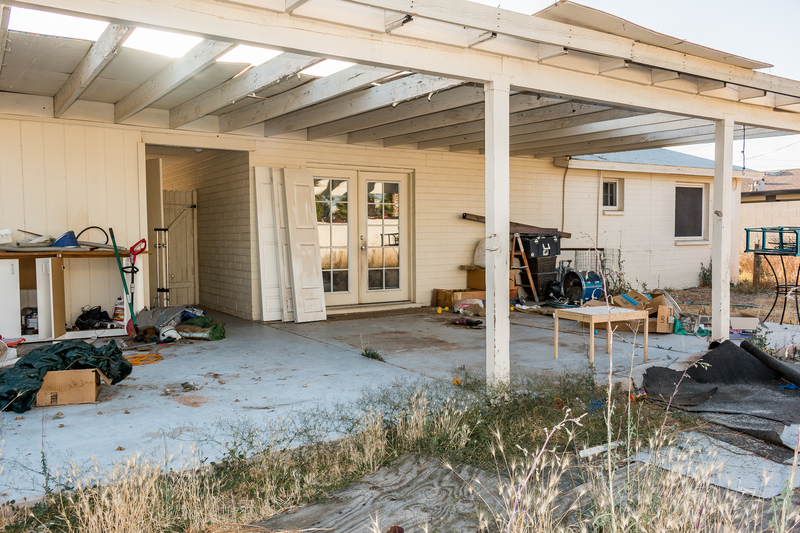 This house hadn’t really been touched for a few decades. These post-war homes were exceptionally basic, and built before a lot of the fussiness of the 70’s and 80’s home design were introduced. But, there were some distinct functional obstacles we had to overcome, as well as some pricy design upgrades that needed to happen. 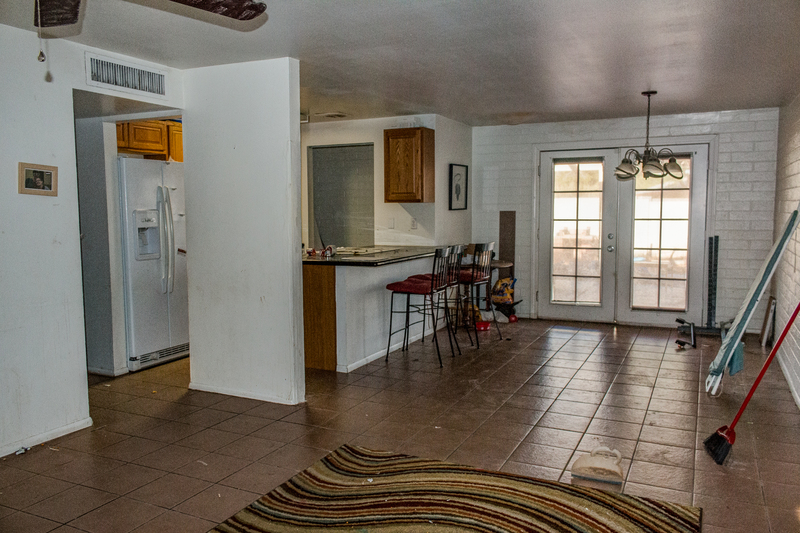 A few things to be noted here: The first thing to go was the odd separation wall between the kitchen and living area. Most of these homes have some variation of this and it is usually not load-bearing and easy to remove, like it was here. 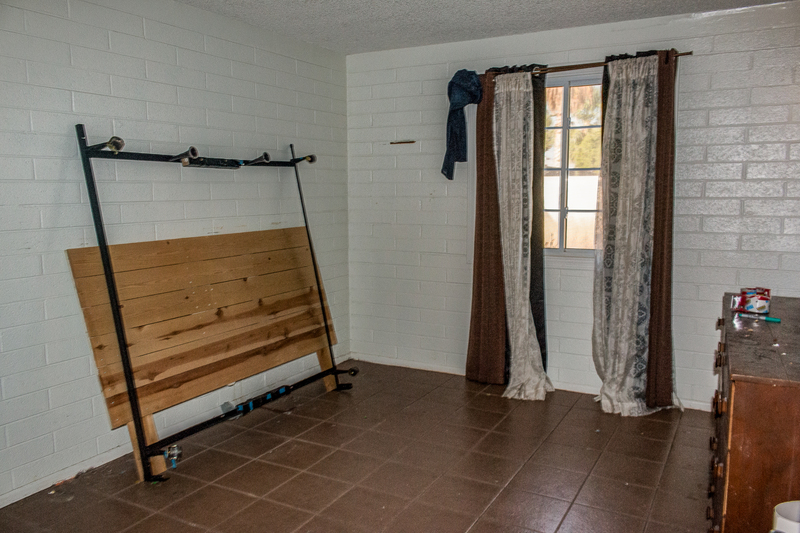 You’ll also notice that most of the exterior walls were old-school block, with no dry wall or texture. Those all were refinished for a smooth, cohesive look. 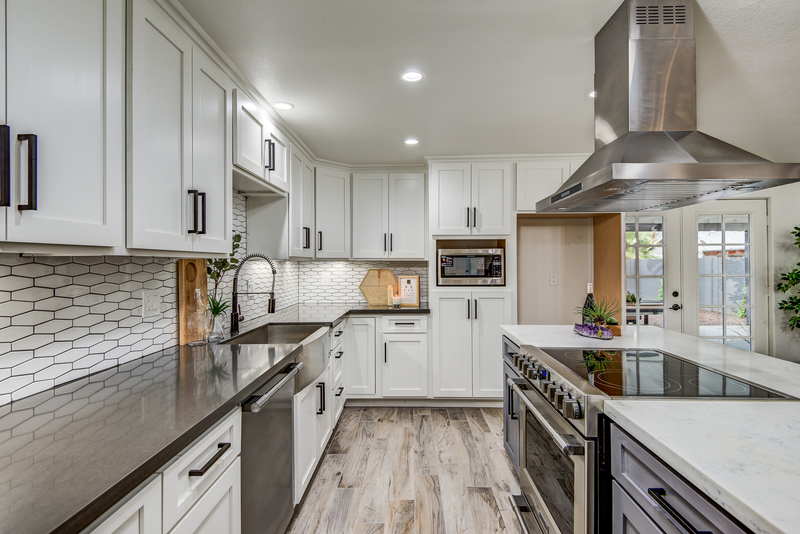 There were a few issues that had to be addressed in the kitchen, and the biggest one was the partition wall and large pantry closet. This was all demolished right away! 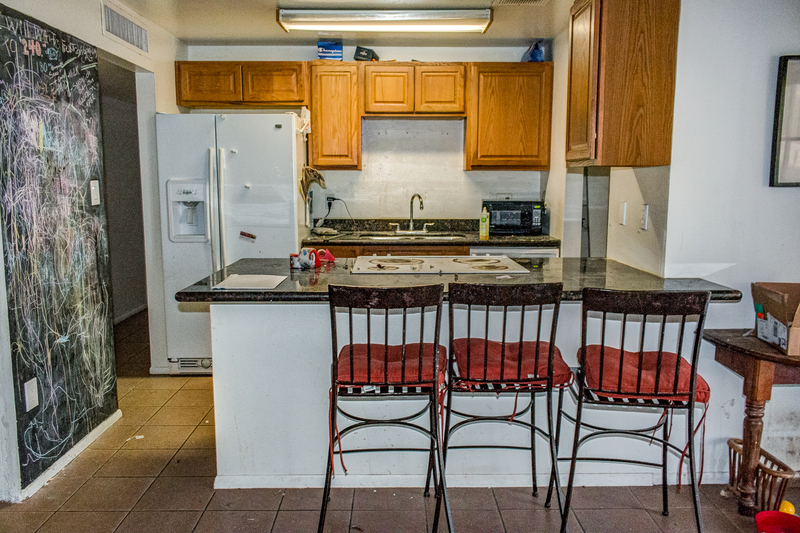 By removing that odd little room and the wall, we were able to increase the kitchen size tremendously. The reconstruction of this kitchen called for an entirely new cabinet package, which framed the space really nicely. We were obsessed by that 7-foot (SEVEN!) 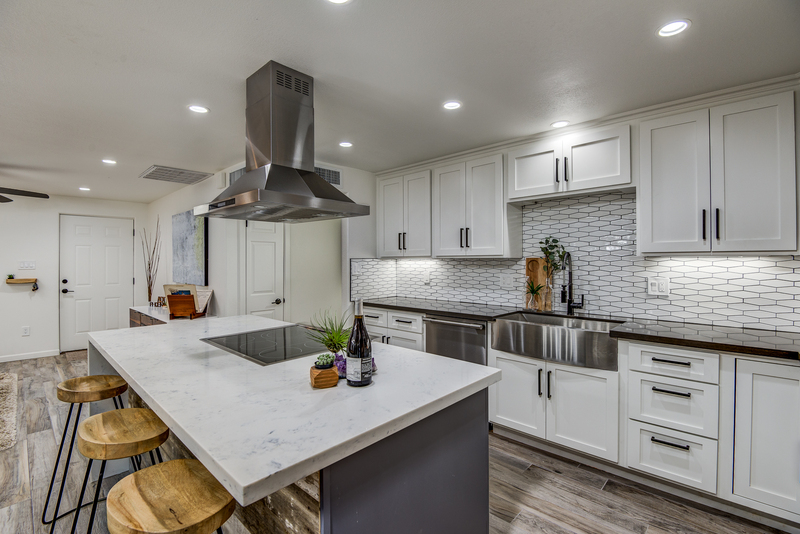 island with the waterfall quartz countertop! With that waterfall edge facing the front entry, it really gives a statement effect to the home the moment you step inside. We finished off the space with strong cabinet hardware, a jazzy backsplash, and a little touch of Porter Barn Wood on the island. Even the bedrooms of this home needed a bit of extra love, with the walls all needing a complete refinish. 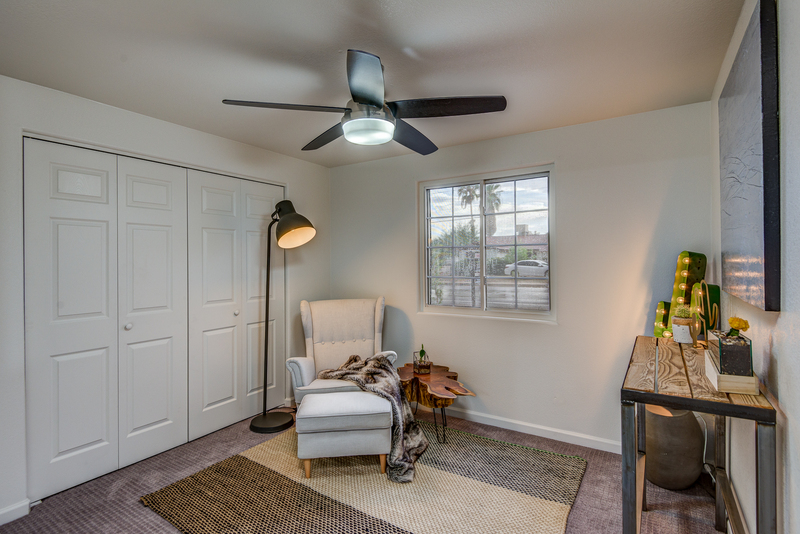 Drywall and texture to each, with new carpeting and ceiling fans. 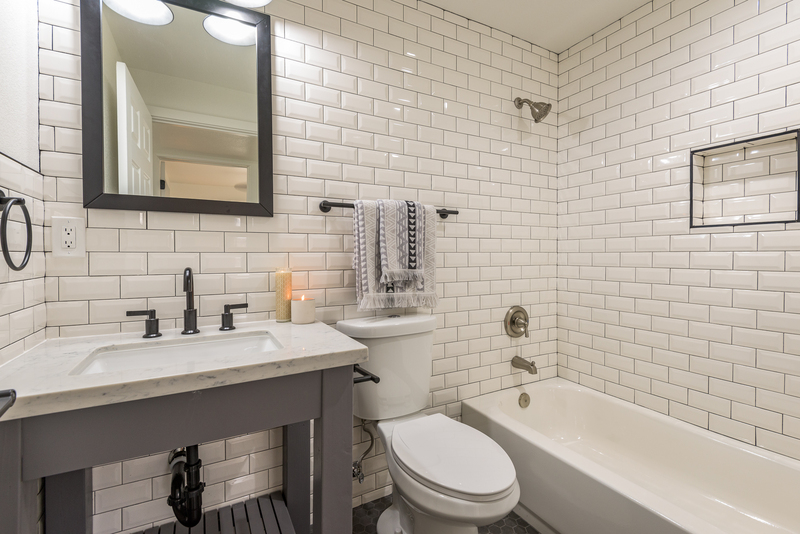 The guest bathroom got a complete renovation, and was actually made smaller to allow more space to the master bathroom behind it. 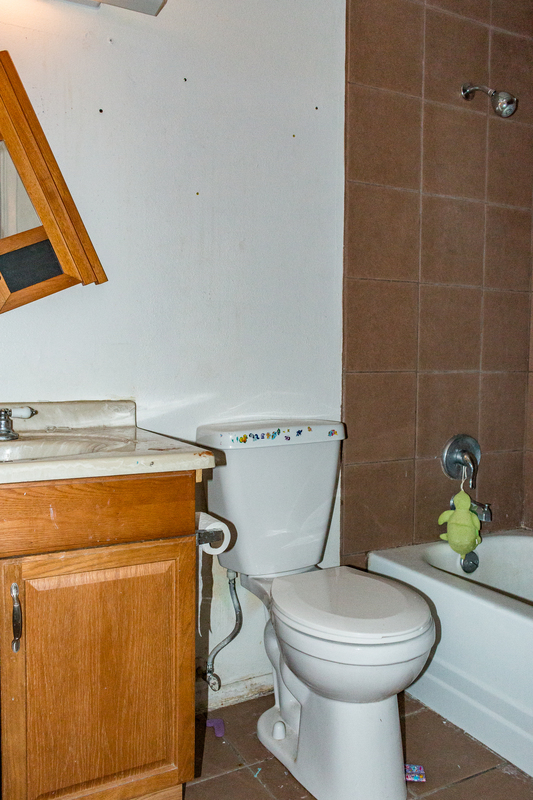 You’d never tell, though; in person, it looks like a completely functional, proportionally-sized bathroom. The two guest rooms got a nice clean up, and the bathroom had to be completely gutted. The vanity is custom made, and I love the idea of adding baskets on the bottom, with folded towels or paper. 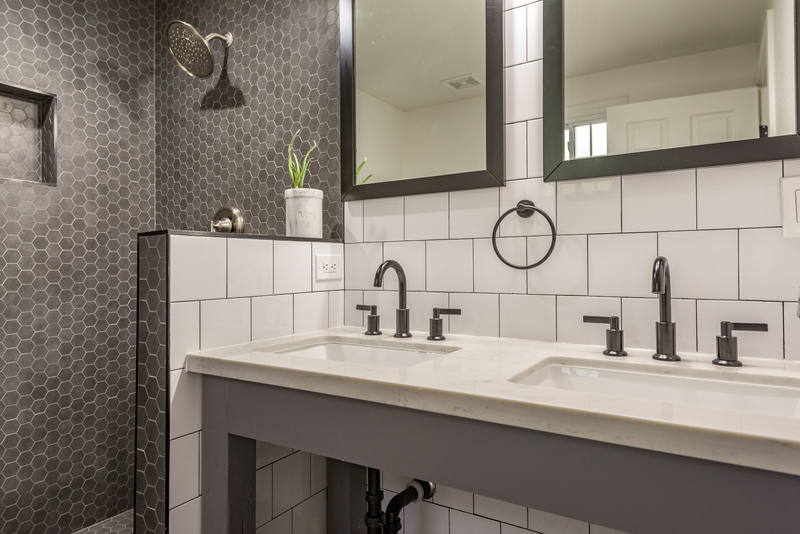 Beveled subway tile lined the walls, with more of the matte black finishings to keep the space consistent with the rest of the home. This home isn’t a large one, and we made no claims otherwise. 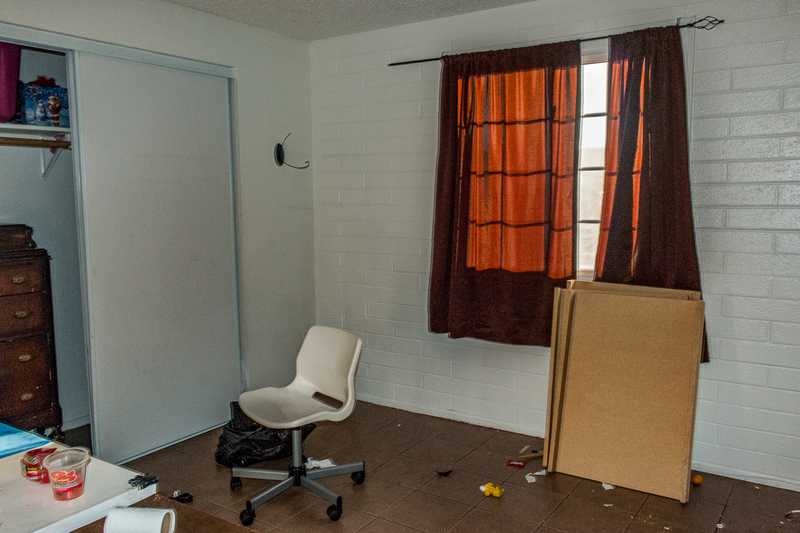 At 1,180(ish) square feet, our hands were tied when it came to the room sizes and available living area. But, we were able to make some sizable accommodations to the master bathroom, by increasing it by almost two-fold. 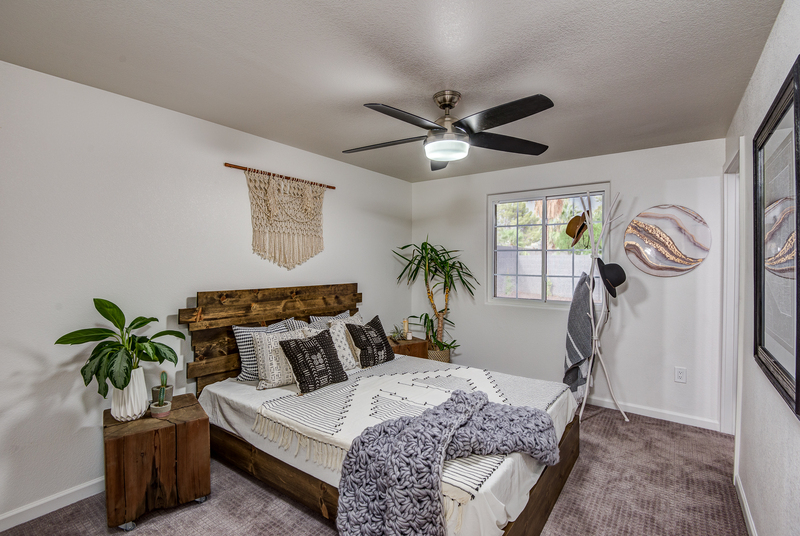 By borrowing wasted space from the guest bath, the master suite is now up to 2017 standards, and we couldn’t be more proud by what we were able to squeeze in there! The before photos are hysterical! 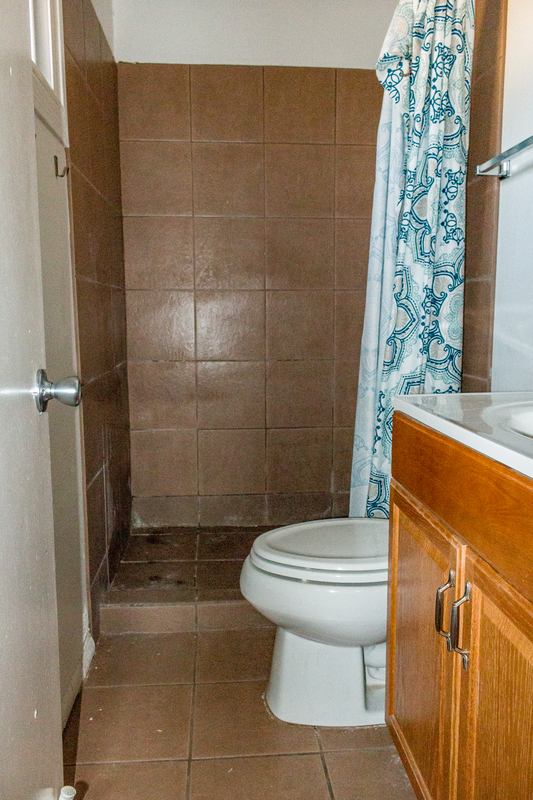 The master bathroom was SO SMALL we could hardly fit in to take a photo. I, a 5’2″ little woman, could palm both sides of the walls. Talk about a tight squeeze! By expanding the bathroom, we gained enough space to install a dual vanity to match the guest bath. The shower is now large enough to fit an actual-sized human, and we relocated the toilet to the adjacent wall to make it all happen. More special touches in the floor-to-ceiling tile, and finishes stayed with the design theme. Most of these homes have single-car carports, and that was the case here. 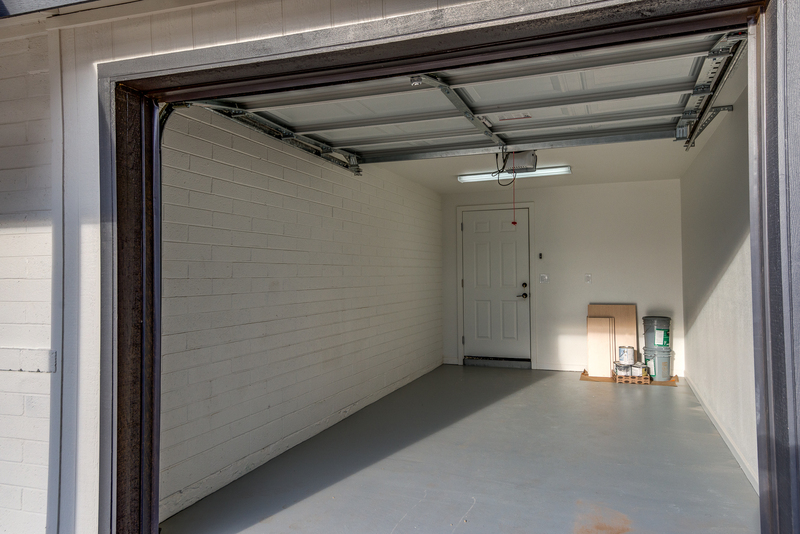 We were able to enclose this to a finished garage, and added direct access to the home. 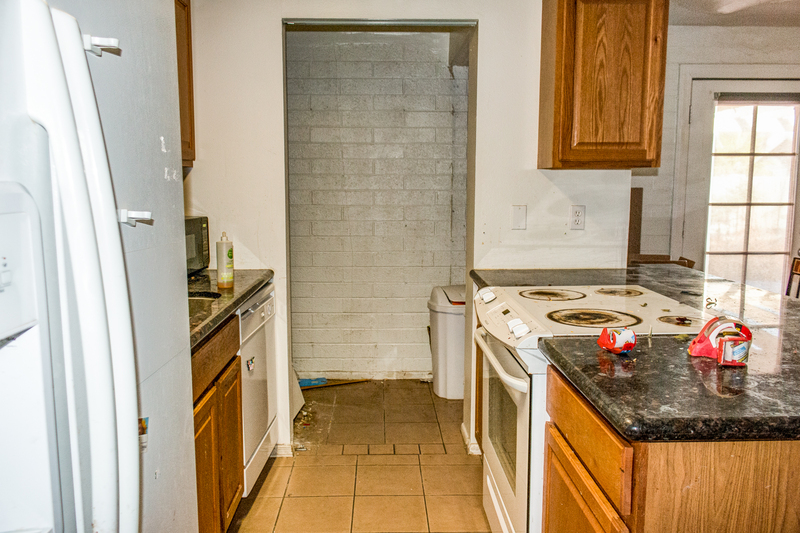 Access to this area is off the kitchen, and the transition feels completely natural. 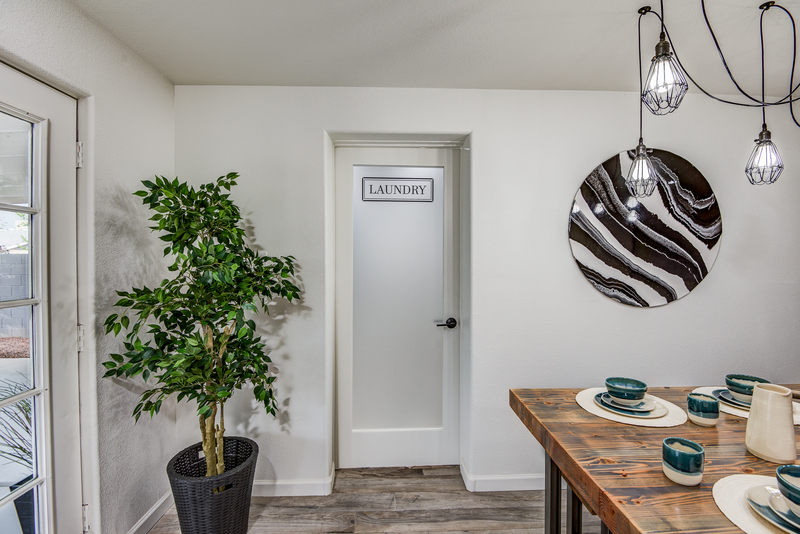 We are pretty proud of creating this space, and I think the drop-zone feature is one of my favorite spots in the house! 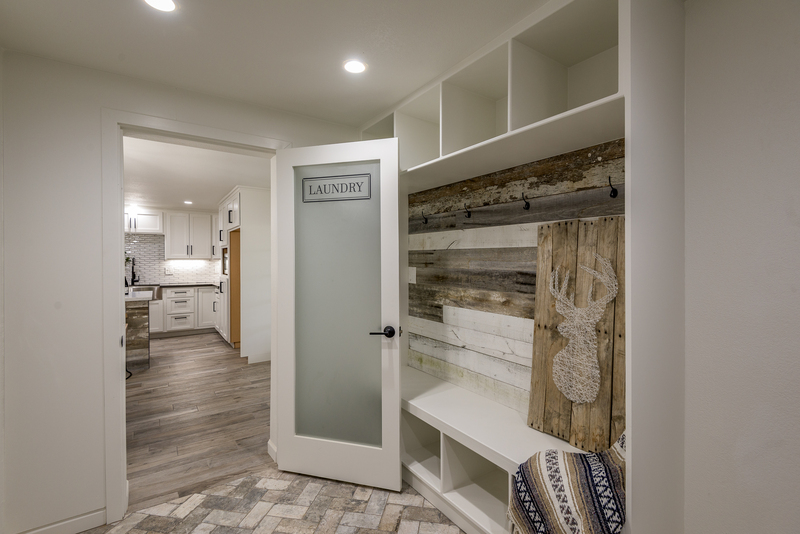 We loved adding the Porter Barn Wood accent in the cubby area. 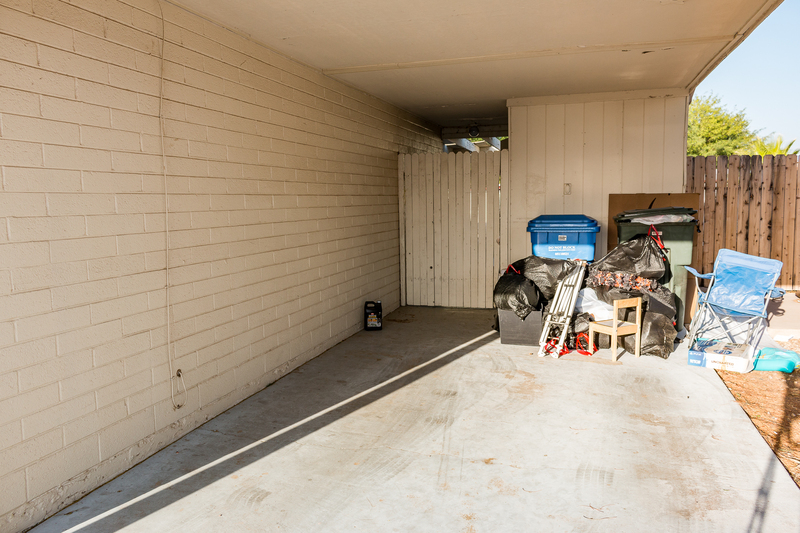 I can just imagine coming in off the garage with arms full of groceries, or the kids with backpacks and muddy shoes after school, and the chance to unload your day before you step in the door. As hopefully you can see, the roof and AC had to both be replaced. We went with a dark, dark shingle roof and a stark white paint. Grey trim tied it all together! Part of the backyard wall had to be replaced, and we painted the block to match the dark grey trim. 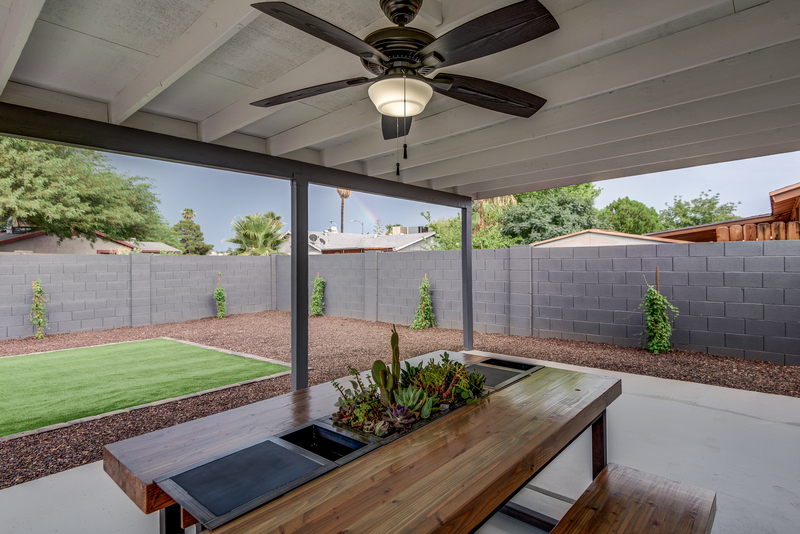 Simple landscaping and a refreshed patio space finished it all out nicely! So, maybe “refreshed” isn’t the right word for it. The backyard patio was almost entirely reconstructed. 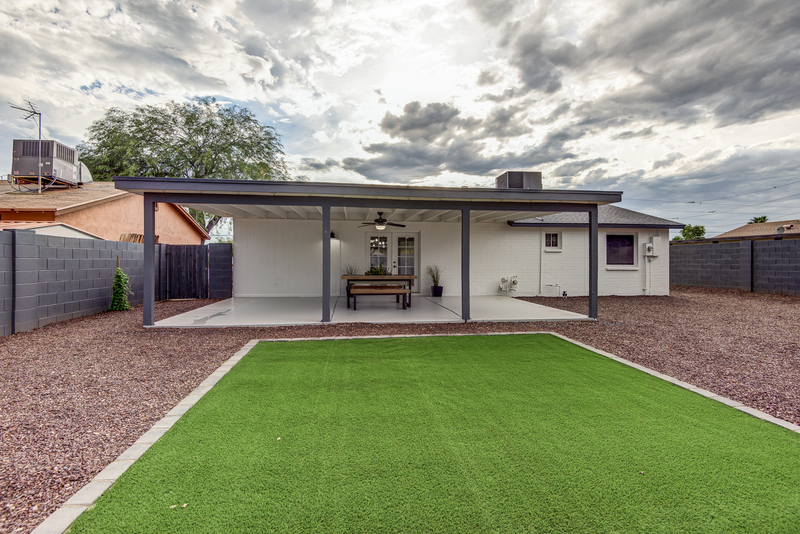 The yard, roof and exterior had suffered from years of neglect, so it took a lot of love and tough work to bring this home back to life. 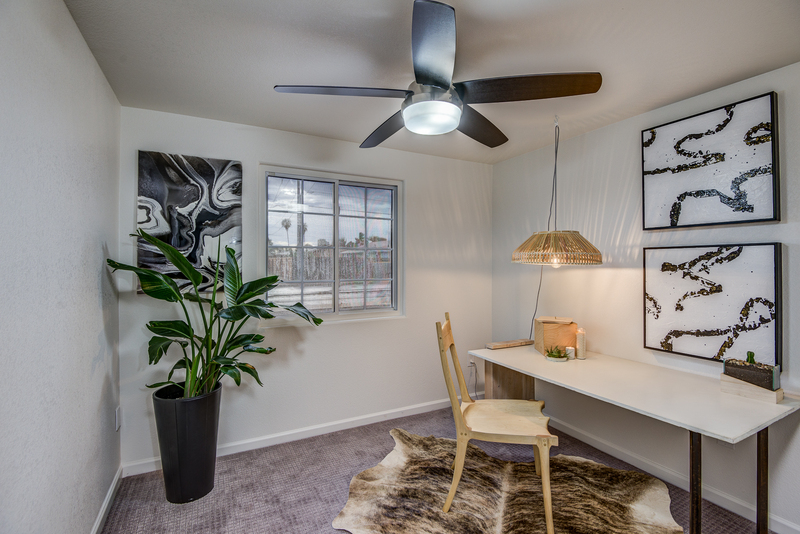 But now, the space is so welcoming and beautiful — and low maintenance! Bryce and I had so much fun working with this home. It’s come a long, long way and we are so grateful for the change to help spruce up our own neighborhood! We’d love to know what you think about this latest remodel of ours, so drop a comment and let us know. 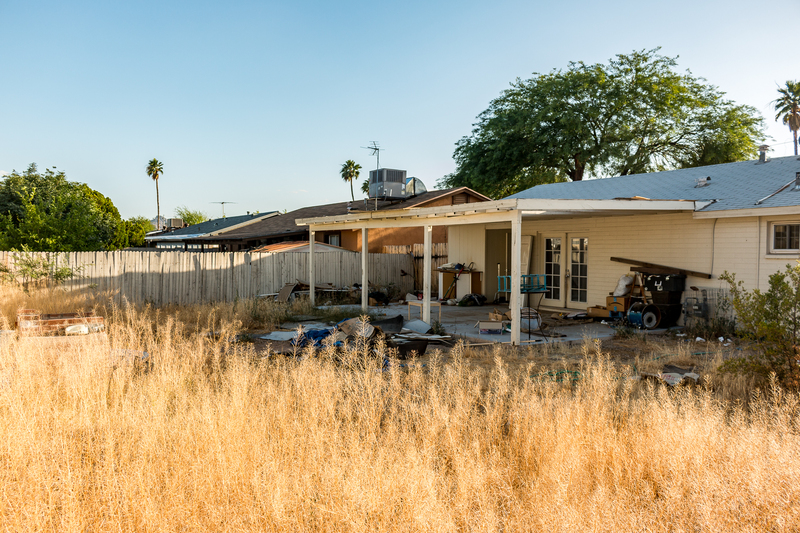 Or, follow us on social to hear about our upcoming projects in the Phoenix area. Wow, you guys did an amazing job on that house!! TRANSFORMED! Love those bathrooms! Thank you so much!! We had the best time doing it! This transformation is remarkable! I love how clean and bright this home is. We have many many projects before our own home will be this inviting and it’s easy to get overwhelmed but your blog always brings new inspiration! Thanks! Thanks! 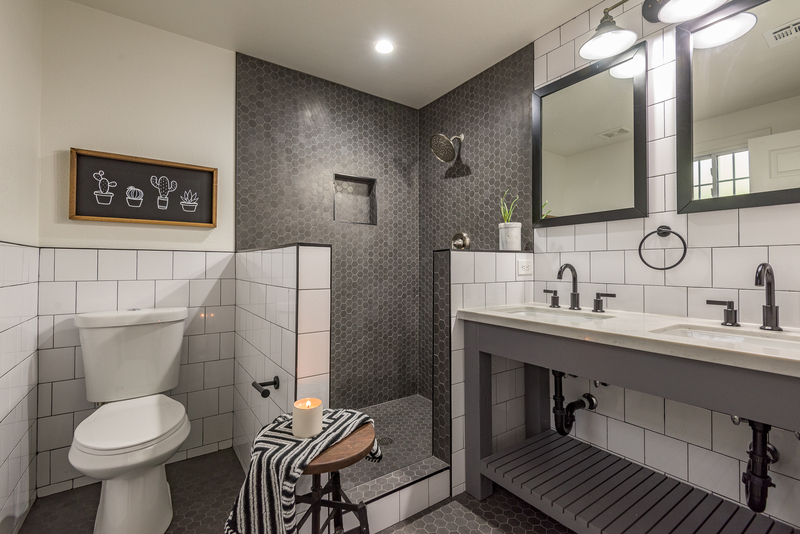 Can you tell me what light fixture you used over the bathroom vanity? I’ve been looking for something just like that. You can probably find these or similar on Amazon for great prices! Hi there! 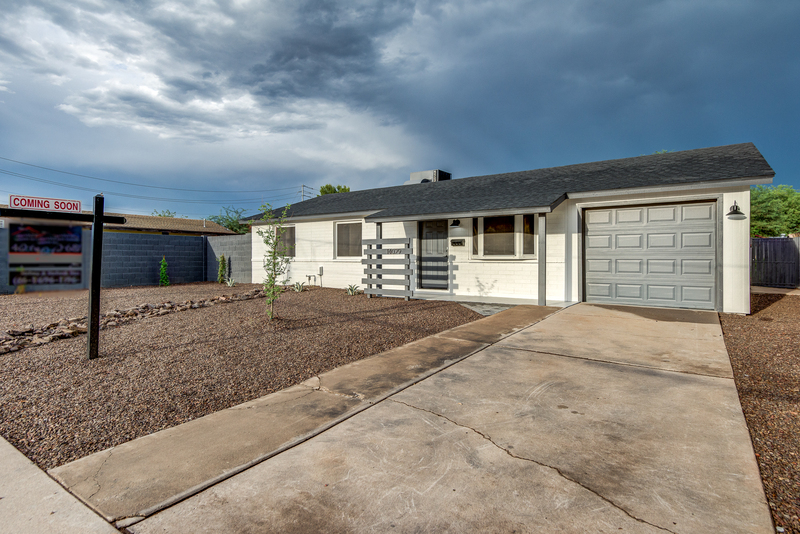 This property has sold, but we have two more coming up in the Phoenix area in the next few weeks. Hi! 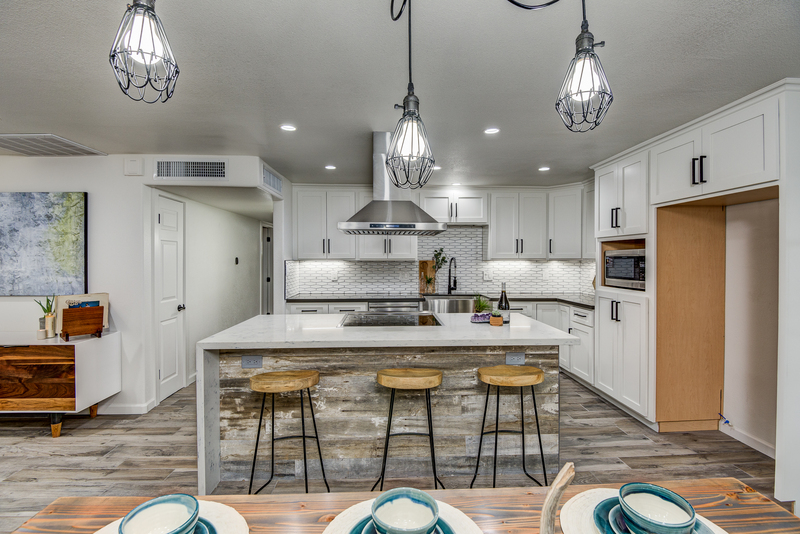 The kitchen island is fantastic! 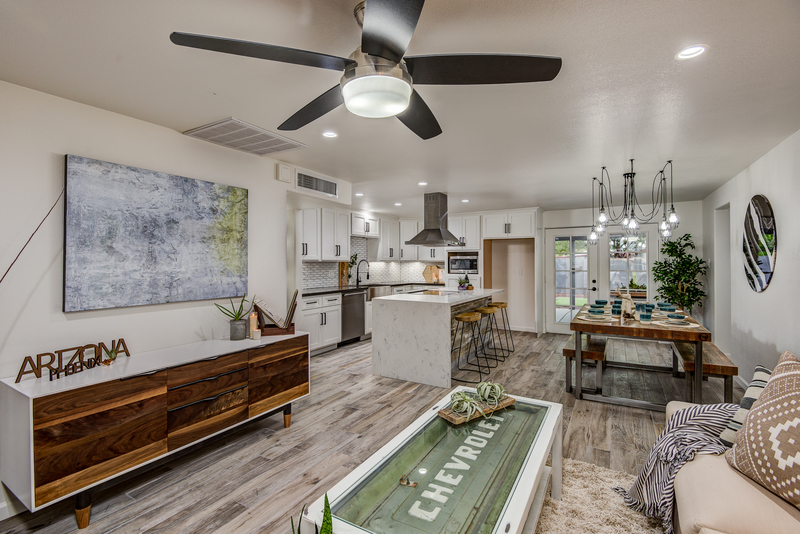 Can you tell me what type of material you put down for flooring in the living and kitchen? Is it a wood product? Thanks! Hi Melissa! Thanks so much! That flooring is a wood-like tile that you can find at just about any home improvement store. We try to stick with larger sized planks for a more luxurious look! Try Home Depot or Floor & Decor.